After dogged by issues of very different natures during last weekend’s Austrian Grand Prix, Mercedes and Renault both have made alterations to their power unit to decrease the risk of further reliability issues. Both Mercedes drivers retired from the Austrian Grand Prix. Valtteri Bottas’s car came to a halt after a power steering issue triggered by a loss of hydraulics pressure. Lewis Hamilton was also forced to retire and end his 33-long point-scoring streak following a fuel pump issue. Mercedes identified the issues on Monday evening and found fixes to cure the issue. The technical gremlin seen on the Briton’s car is engine-related which prompted Mercedes to roll out a fix, a slightly modified solution which its two customer teams Force India and Williams will use as well. Valtter Bottas revealed that Mercedes was working hard to find to root of the issue. The work began right after the race on Sunday night and the solution was found by Monday evening. The Finn visited Mercedes’ base on Tuesday and Wednesday and followed the process of how the team tested the possible fixes. Nico Hülkenberg retired from the Austrian Grand Prix after a spectacular failure resulting in a smoke cloud. Renault investigated the technical glitch and found out that the turbocharger caused the fatal incident. The turbocharger failure was of the same nature as the one suffered by Daniel Ricciardo during the Chinese Grand Prix weekend. However, Renault did not take counter-measures after that, but planned an update which arrived for this weekend. Asked whether other elements of the power unit was damaged, Renault boss Cyril Abiteboul sounded sanguine. “Nico's turbo is definitely dead, but the ICE and the other components should be OK."
The German will use his third and final turbocharger at Silverstone with more than ten races to go. 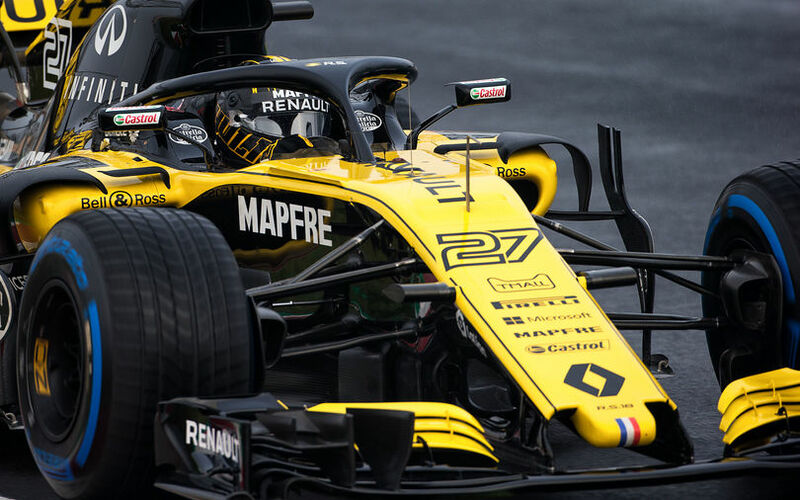 Renault is, however, sticking to a four-engine plan, sacrificing a weekend by taking fresh units and serving grid penalties. "We were on a plan of using four engines, to keep on with the development pace, and in particular the introduction of the C-spec, so that does give us some latitude for this type of situation,” concluded Abiteboul.